A lot of wild things that will never see the light day come out of CES every year, but SuperTooth’s Multiroom System looks to be a very practical solution to a real-world (albeit first world) problem. The French-based accessory debuted a brand new five-speaker system that connects through a simple Bluetooth pairing with any cellphone. SuperTooth’s goal with the Multiroom System, according to Vice President of Sales and Marketing Yves Le Reun, was to “deliver a package of multi-room speakers already pre-installed to make the experience seamless.” They have done this by ensuring that the Bluetooth capability of the speakers is built-in from the factory, meaning there is no re-wiring or other installation needed. Even similar speakers such as WiFi can become complicated when setting up, and may not support everything. But if you have a phone with Bluetooth capability and a SuperTooth set of speakers, you’re good go. All five of the speakers in the Multiroom System will be controlled by an iOS and Android compatible app, which will be available shortly. The Multiroom System will come in two color options (black wood/grey grid/black cloth or light oak wood/white grid/grey cloth) when it releases in Q2 of 2015. 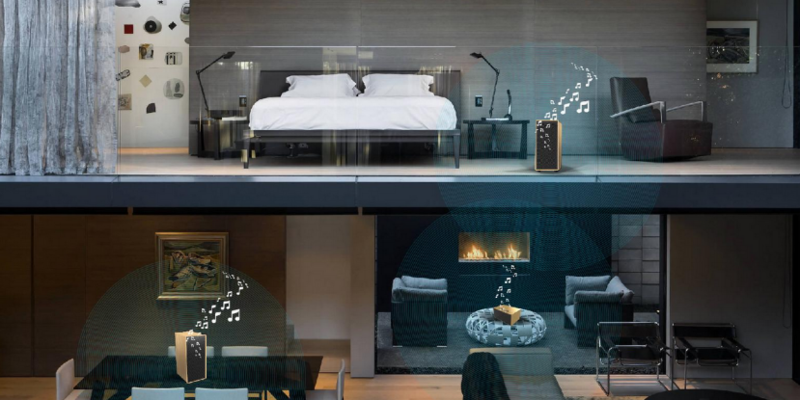 For $299, the system stays on point with most similar systems, if not considerably cheaper depending on how high-end you go with other smart-connected speaker systems.